1 Quantity of Rich shortcrust pastry. Thaw and roll out to fit a buttered 20cm flan ring. 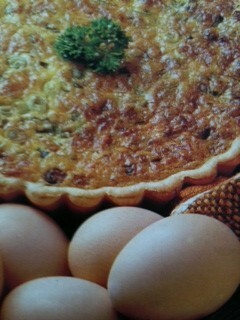 Sprinkle bacon, spring onions and cheese into the pastry shell. In a small bowl, place eggs, cream, milk and seasoning – beat well. Cook for 20 – 30 minutes or until golden brown.